This topic is meant to be a Terrain and Landscape Study, the purpose of it is to Study Terrain/Landscape/Scenes that you like and work twords producing that same quality. In your own art. I create content I will pull a screenshot from one of those game and try to produce something equal to or better than the screenshot I am referencing. 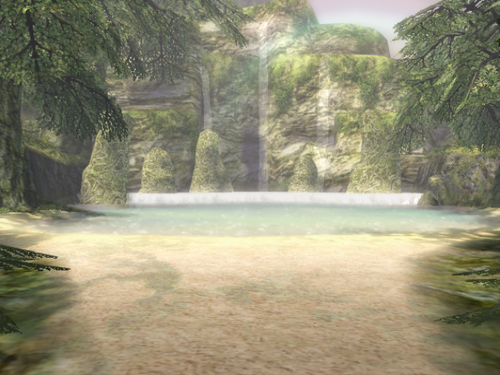 In this case I had two Twilight Princess Screenshots for my insperation, both water scenes. Here my target was a fish. Here is what I was able to produce. Here my target was some kind of water scene that was fitting for the game I am working on. So far I am happy with the results I was able to acheve, one of the best things I can tell anyone starting out with Graphics and Game Design is to "Find the Work Flow" that best works for you. In another post I will point out where I had diffacultys, and what Improvements I think would make this scene better besides finishing it. And what my work flow is. The water with the bridge looks really good ! This sort of data can be combined with a basic height map to add details. Thanks for the comment, link and contrabution to the topic anael I am definitely going to make use of that link some really great info there. Anyways in my last post I was going to point out some diffculties, the first problem I had was. 1. I ended up with something completely differant than what I was trying to model. Notice in these two screenshots where my waterfall spills into the creek and the ordon spring there the same basic shape but mine ended up being a small waterfall and creek. I could have kept going and turned the following screenshot into a canyon with a rope bridge and had a fairly large terrain. But that lead me to my next problem. 2. How to get lots of fine high resolution detail into my texture without it being a 300mb image. I had to start to back-up off of my terrain to get some distance from me and the view of my terrain in-order to limit the amount of blur and pixelation I was seeing on my terrain texture. Thats why my large terrain turned into a small one. The next problem I ran into was that I wasnt in the mind set that this model should be as close to production ready as possible I was just kinda going with it. That lead me to a few problems with my terrain mesh. These problems caused my terrain to be extremly diffacult to extend and modify and the start of poor performance. Not to mention mobile devices have a Polycount in View, Texture Size and Texture Memory limitations so the scene I had created might not even run on an Iphone or Android device. Now having an idea of what I wanted to do I set out to fix my terrain mesh by creating a new lower poly and smaller texture resolution version 2048x2048. The next problem I ran into was that I tend work twords getting my scenes out of blender painted in such a way "Shadows Included" that when they are imported into Maratis they look exctly the same. This works most of the time but one particular case where this wasnt the case was trying to bake the shadows of the leafs/branches/tree onto the terrain texture. 6. Blender will bake the AO of the shape of the mesh and not the image contained"Leaf"
This left me with square/blocky shadows baked onto my terrain texture under the trees. I was able to fix this problem by just using a spot light in maratis and enbling shadows. This is the final result in trying to solve some of the problems I had just talked about 1. A new Lower Poly, Cleaner version of my Terrain, 2. Smaller Texture Map, Tree Shadows from a Maratis Spotlight with Shadows enabled. I really like the bridge. Thanks I was looking at this when I started it there is still alot of texture work to do to finish the bridge. Your scene is really cool ! When we're on the topic, how do you make objects transparent? Which section in Blender? What do you mean like a 2D cutout like leafs on a tree or like a 3D glass ball? Thank you and THANK you lol didnt know about that option. Cool stuff. I'm working with Wings 3d for my terrains meshes, that way I can control what parts I want to be detailed a bit better. Also, when I'm exporting from my csg modeler, I'm importing it into wings3d and creating a single texture . haven't done anything with maratis from this process yet, But that's coming this weekend. Thanks and Looking forward to seeing what you come up with Wrapscallion. yeah....gonna need help with the blender import/export stuff, i know i can go to a blender tute site, but I need it in normal english, not linuxspeak. things i know i'm gonna need help with....texture import in blender , importing a model in maratis , how would bones/rigging from a different modeler work in blender? Can you elaborate, on how data from the johnflower site, can add 'detail' to a existing heightmap ? The data from johnflower seems to just be heightmaps ( which is the realworld data you refer to) ,so Im confused atm what you mean. Also,and this isn't entirely fair to ask you ,,,Zester I think is away doing dev work on Ubuntu phone,so could you possibly elaborate on how he made/applied his terrain texture ? It has several textures which wouldn't be ideal/easy for average person to deal with given faik, it mandates shaders,,did he possibly just texture the terrain inside a paint app and bring that uvmap back in or just update it. - About the data from real world, I mean it can 'add' some detail because you could multiply these height map (because there are realistic) to another less detailed height map (done for example with photoshop). - Zester probably just created a big diffuse map that mix all the different textures without any particular shader. I think he painted the base directly in Blender with a final touch in Gimp or Photoshop. That Rage terrain is pretty cool. So while I was studying anael's rage terrain screenshot, I was completely stumped I had no clue on how they were generating that surface detail. I tried for days and couldn't get anything remotely comparable. And I knew that they were not modeling every detail by hand and even with shaders and there mega texturing system there was something particular going on in that terrain that I wasn't figuring into the problem. Then it came to me ........ there using 16bit heightmaps. Most of us are accustom to using 8bit heightmaps and wouldn't know a 16bit heightmap if it hit us in the face well no one would. The additional coding in a 16bit heightmap is invisible to not only our eyes but your computer screen. 200,000 faces about what that rage terrain probably has. And you know what I started to see!!!!!! 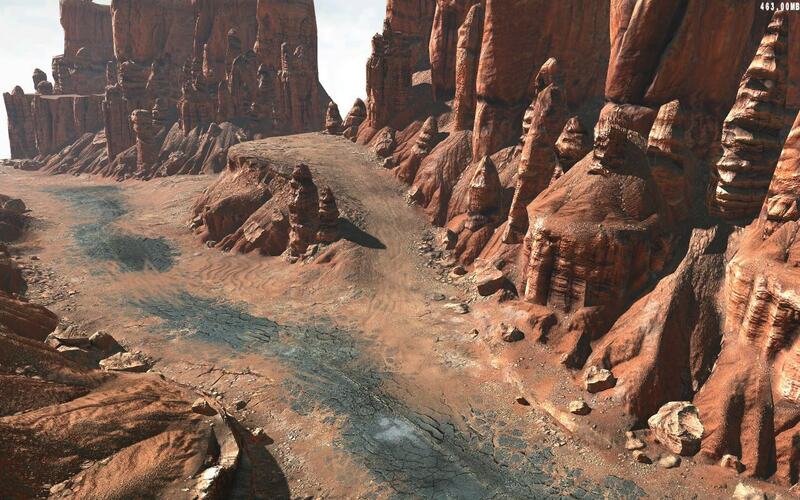 Roads, cracks in the earth, lots and lots of surface detail made that rage terrain look like some indie job!!!! And anaels right my terrain was just a diffuse map painted in blender. Using the differant brushes and setting,s. Nothing special or even hard. Not following you, and Im not a longtime user /fan of blender, but I'll try here: Were these brushes part of default blender, or did you find them online and add them to brush section, and if so is that a very involved process ? Not everyone is a longtime blender /modeling user, sometimes we need a tiny bit of hand holding, but that doesn't mean we aren't capable , just new , but very interested If there is a TUT that covers the basic idea of what you did, that would be more than fine too. Just a quick start or such. I have an idea,so I will start on that for now. Anael was thinking you may have used gimp at some point, so if I understand you correctly you did it all in blender,just using brushes and prob. loading in your own textures for them. I say that because your terrain texture near bridge, doesn't look like any brushes I've seen in blender, so maybe you did touch them up in gimp or PS ? I didn't use any external image editing applications and I only used the TexDraw brush(It should be the default brush in texture paint mode) that comes with blender and I adjusted the "Radius(Size of Brush)" and "Strength"(How transparent the paint is) depending on what I was painting. I used 4 different textures(images to paint with). figure you could still do just as good of a job if not better if you spent a bit more time on it. I will make a tutorial, might take a day or two because I like to take a pic for every step. OK yup I understand totally. I wasn't sure is all, if you used default brushes ( as in textures: I think blender comes with a few built in ?) or if you loaded your own and assigned them in brushes section. I understand all the rest no problem at all. I had no luck getting anything I texture painted inside Maratis, so I look fwd to knowing the way. If you know, what exactly is the difference between just texture painting and this brush method ? I think I recall Anael saying ( or somebody if not him) he wishes they would remove tex. painting as it wasn't a optimal way of doing things,etc. I'm still having no luck getting what I texture paint inside Maratis from blender or any other modeler. I know this is a OLD thread but its certainly applicable still. I saw Anael's page about multiple materials, but that is of very little help, because materials alone give no depth whatsoever ( short of VERY simple visuals/games), so for decent professional work you need texture painting , but maybe the way Im doing it wont come into maratis from its exporter. I cant get the object and its texture inside maratis, but instead of a lot of grass on one EDGE of terrain model and sand everywhere else, its like sand is mostly everywhere, and grass only in small bits in a few places, and this is definitely not how it looks inside blender, yet blender render shows it closer to how it shows up inside maratis.Very confusing. I wish zester had been more specific about how he did the splatting texture work, but given what Im doing so far isn't working as far as getting it to look right inside maratis, I wonder if zester was just using stencil maps inbetween his textures, where atm IM not doing that as I just load the textures and start painting with 'texture painting' panel. Ive been Very busy making models so Im left texturing for another day, but that is coming very soon , so I wanted to get back into it. I guess I'll have a look at the Tutorials on wiki, but I also felt that if someone came here first and saw this they might be a bit confused, as 'materials' here that sadwolf used LOOK more like textures than materials. I am having materials issues also. Only way I can get them in is an export from sketchup directly to maratis using assimp. Also Scuptris textures work using assimp also. I would like to use blender, but perhaps sculptris is the best way to go so far. thx for verification about blender, as it seems somebody that knows a lot more of how an what it does will need to help us on this issue. Frankly I really think I prefer sculptris, so I'll try it along with skethcup ( though for awesome features you really need PRO version, but meh). Actually now that I see the website, not even a non profit organization as I have, can use sketchup make for profit of anykind, so that's out of the question now Even a non profit is allowed to make some profit , as long as its under the norm. Oh, skethup doesn't allow you to paint textures. But the applied textures get in okay. Sculptris is best for paintng. Applied textures won't cut it for 'some' things, but many other static objects prob. just fine. I think in terms of landscapes a lot, as its what I love doing, and for that painting textures ( splatting , whatever one wishes to refer to it as) requires multiple ones.